I entered knitting in the HOT Fair again this year (my second entry). 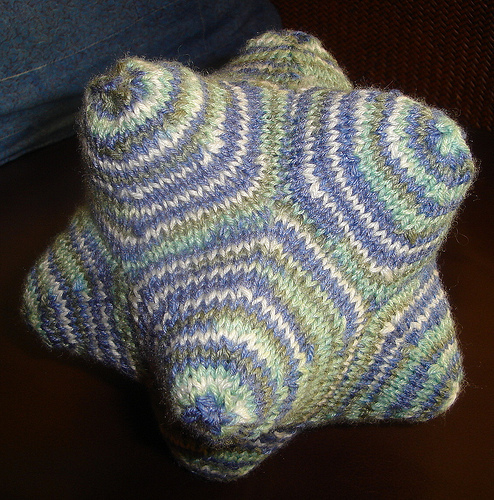 Once again we were limited to one item per category, so I entered the Twist & Shout in the knitted garment category, and the twelve-pointed ball, which turned out really cute, in the knitted accessory category. I originally meant to put a jingle bell or some other noise-maker in the centre, but didn’t think about it when I went to buy the stuffing, so it’ll have to go in the next one (I bought three skeins of the same yarn in different colours). Rehearsals for Noises Off are coming along well. We have close to a completed set now, which makes things much easier. We’re re-using part of the Best Little Whorehouse set, but the stairs had been taken down, so the three doors downstairs were having to do double and triple duty (there are meant to be four openings downstairs and four upstairs). Haven’t been able to do as much recording as usual. Had a cold a two or three weeks ago and now my allergies have started acting up. I was having to stop every other sentence or so, during my recording session yesterday, to clear my throat or rub my itching nose. I hate allergies.